KTC was awarded Harmonious Labor Relations Unit 2017 by the Leading Group Office of Labor Dispute Prevention/Mediation & Harmonious Labor Relations Construction of Longgang District, Shenzhen recently. This honor fully recognizes our efforts in abiding by the laws and regulations, in safeguarding the rights and fulfilling the obligations of both the company and our employees, and in constructing harmonious labor Relationship. 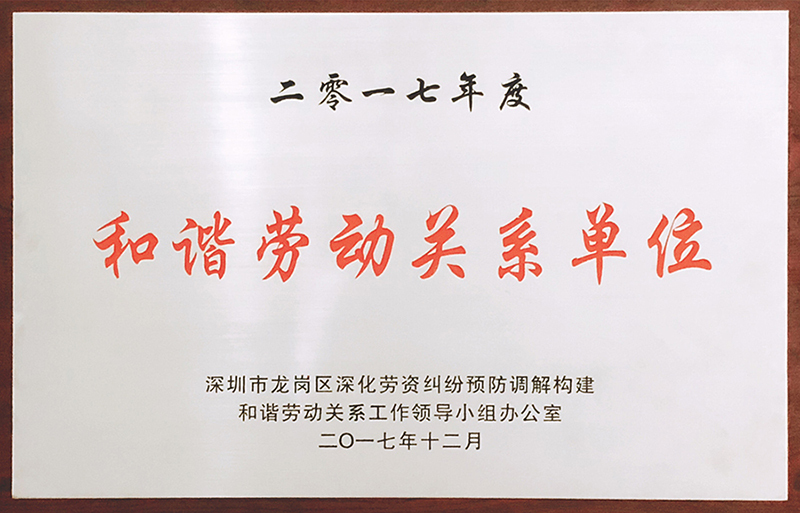 It is reported that the honor went to 11 industrial parks and enterprises in Longgang District, which stood out in labor laws and regulations compliance, employee benefits, corporate culture innovation and labor relations promotion after the procedure of application/recommendation, assessment/appraisal, public comment and formal notice. KTC always place employees’ rights and interests as one of its top priorities by abiding by the Labor Law, Labor Contract Law and other laws/regulations, emphasizing scientific management and safety production, and establishing labor union and labor service center. KTC will remain committed to promoting an equitable, stable and harmonious labor relationship, enhancing our employees’ sense of identity & belonging, and further fulfilling our share for a better society.